As I mentioned about three weeks ago, stocks have been climbing walls of worry throughout the recovery which began some 5 ½ years ago. Almost every selloff in the past two years has been accompanied by/caused by an emotional response to new or recurring sources of uncertainty and fear. The latest wall of worry was built on a foundation of concern for the health of the Eurozone, the Chinese economy, and the spread of Ebola. But as long as the economy avoids a recession, it is hard to keep stock prices down, especially when cash yields almost nothing and earnings are robust. If the fears aren't realized, emotions drop and prices pop back up. 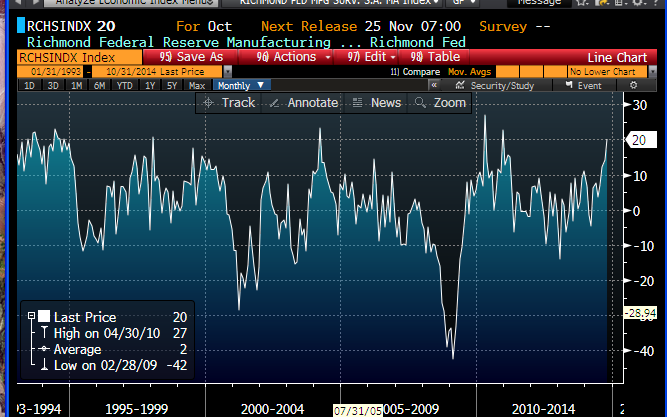 I don't usually pay much attention to the regional Fed economic activity indices, but today's release of the Richmond Fed's Manufacturing Index piqued my interest. It's normally quite volatile—which is why it should be taken with a few grains of salt—but the latest reading was the third strongest in the current business cycle expansion, and over the past 20 years it has only rarely been this strong. Something good must be going on in the Richmond area. 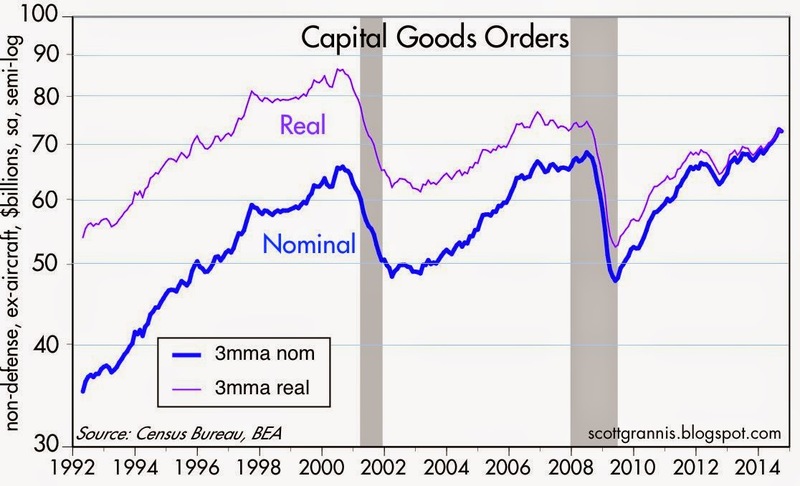 September capital goods orders were down a bit, but this series too is quite volatile. On a year over year basis, orders are up a solid 7.6%. Using a rolling 3-mo. average, the index is up at an annualized pace of 11% over the past six months. By just about any measure, this proxy for business investment looks healthy and strong. It hasn't yet exceeded its prior high in inflation-adjusted terms, and that's disappointing, but then again we know that the current expansion has been sub-par, and weighted down by pervasive risk aversion. The important thing to focus on is the change on the margin, and that is undeniably positive. The broader durable goods orders (ex-transportation) is up at a 6.4% annualized pace over the past six months. The Markit survey of Eurozone manufacturing conditions in October ticked up a bit, suggesting that at the very least the region is not headed down a black hole. 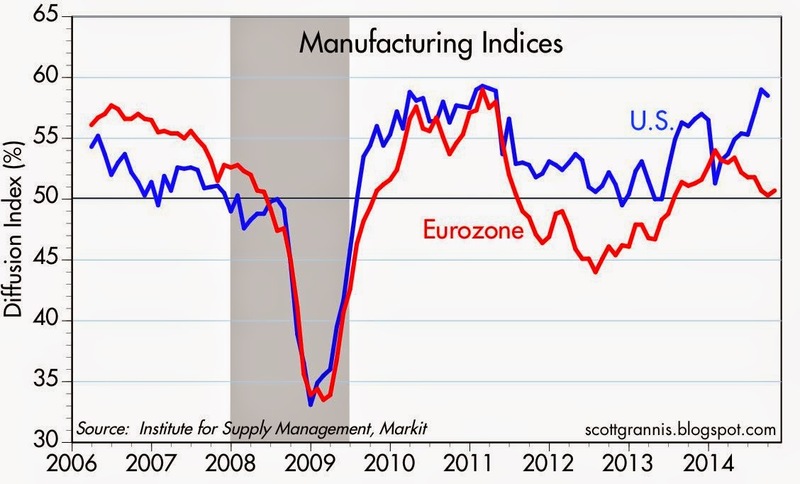 The Eurozone is seriously lagging the U.S. economy, but it is not collapsing. Falling energy prices are virtually certain to make a positive contribution to growth both here and abroad. 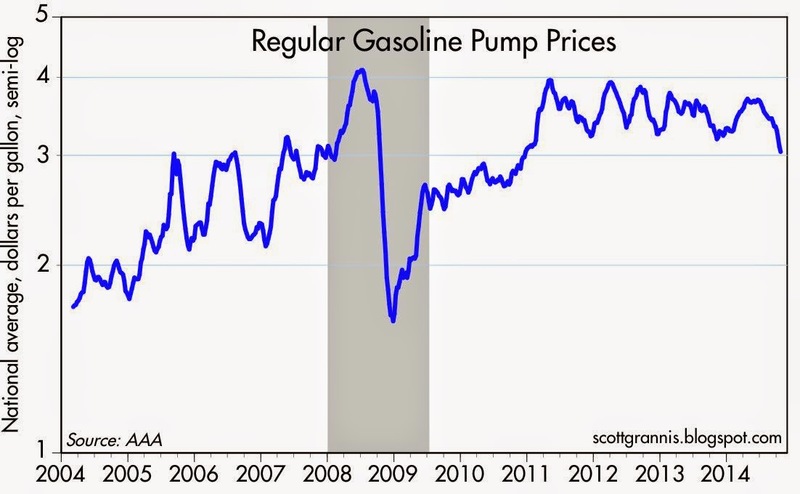 Crude oil is down almost 30% from its 2011 high, and gasoline prices at the pump (see chart above) are down by 25%. Pump prices will likely keep falling to at least $2.90/gal., according to the current price of gasoline futures. It takes energy to run an economy (consumers spend about 6% of their total consumption expenditures on energy), so when energy becomes cheaper the GDP pie tends to grow since money is freed up for other things. UPDATE: (Oct. 31st am) The stock market has now reached a new high, completely recovering from the recent panic-driven selloff. 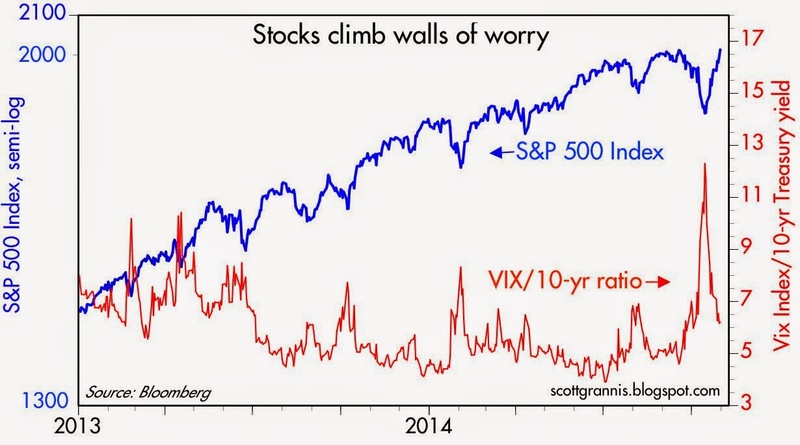 Interestingly, the Vix/10-yr ratio is still somewhat elevated. People are still nervous about what's going on, and the 10-yr yield remains quite low, a sign that investors don't believe that Japan's surprise stimulus measures announced early today will do much to jolt the U.S. economy out of its weak-growth doldrums. Sure would like to see China and Europe clean up their economic acts, ane ease up on monetary policy. try as they may, stock market timing is such an act of futility as to be literally insane to try. to the extent that you're a stock investor, you buy an index fund and never sell. period.